Last night, a mugger accosted two Crown Heights women – in two separate incidents – in a bid to steal their phones. His first attempt was not successful, but his second was. The first incident occurred at around 6:30pm on Carroll St. near Schenectady Ave. A young woman was walking home when she was accosted by the perpetrator, described as an African-American male, about 5’9”, wearing a red coat and blue jeans. The man tried to grab her phone from her hand, but she managed to stuff it into her pocket and tried to flee. The man grabbed the hood of her coat and threw her to the ground, but the victim succeeded in getting up and running away before he could do anything else. The woman called Shomrim, who arrived at the scene and ascertained that she did not require medical attention. They then brought her to the 71st Precinct to file a criminal report. While the report was being filed, at about 7:20pm, Shomrim received another call that the mugger had struck again, this time targeting a woman walking on Kingston Ave. near Lefferts Ave. The thief grabbed her phone – a brand new iPhone 6 – and fled up Kingston Ave. towards Empire Blvd. The woman yelled for help, but was completely ignored by the several passersby. She called Shomrim and tried to follow the perpetrator from a distance, but by the time they arrived he had disappeared. Shomrim, along with officers from the 71st Precinct, combed the area in an effort to locate the perpetrator, but they were unsuccessful. Use this app to track phone and perp. Don’t hold your phone when you walk. As unfair as it is, its a dangerous world out there and it’s not worth it. you call this guy a rabbi??? shame! Who are they calling rabbi? The girl from the first attempt wasn’t holding her phone at the time of the incident. The perpitrator apprached from behind, demanding her phone before grabbing her coat. When she began to run, the perp can be seen grabbing at her coat in an attemp to stop her. After about 50′ her coat ripped freeing her from his grip. At that point she was thrown to the ground. B’H she was able to get up and run in the opposite direction. The perp then joined his friend who was standing on the side, and the 2 casually walked away. The perp was wearing a red hoddie, light colored jeans and a backpack with white wording. 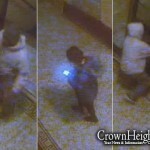 The accomplice was wearing a dark hoodie, dark jeans, and a backpack as well.